The Masjid al-Ḥarām (Arabic: المسجد الحرام‎, literally "the sacred mosque"), also called the Sacred Mosque, and the Grand Mosque or Great Mosque of Mecca, is the largest mosque in the world and surrounds Islam's holiest place, the Kaaba, in the city of Mecca, Saudi Arabia. Muslims face in the direction of the Kaaba while performing obligatory daily prayers. One of the Five Pillars of Islam requires every Muslim to perform the Hajj pilgrimage at least once in his or her lifetime if able to do so, including circumambulation of the Kaaba. The current structure covers an area of 356,800 square metres (88.2 acres) including the outdoor and indoor praying spaces, it is open at all times and during the Hajj period it is the site of one of the largest annual gatherings of people in the world. The Quran states that Abraham, together with his son Ishmael, raised the foundations of a house [Quran 2:127] that is identified by most commentators as the Kaaba. Allah had shown Ibrahim the exact site, very near to the Well of Zamzam, where Abraham and Ishmael began work on the Kaaba's construction in circa 2130 BCE. After Abraham had built the Kaaba, an angel brought to him the Black Stone, a celestial stone that, according to tradition, had fallen from Heaven on the nearby hill Abu Qubays. According to a saying attributed to Muhammad, the Black Stone had "descended from Paradise whiter than milk but the sins of the sons of Adam had made it black". The Black Stone is believed to be the only remnant of the original structure made by Ibrahim. After placing the Black Stone in the Eastern corner of the Kaaba, Abraham received a revelation, in which Allah told the aged prophet that he should now go and proclaim the pilgrimage to mankind, so that men may come both from Arabia and from lands far away, on camel and on foot. [Quran 22:27] Going by the dates attributed to the patriarchs, Ishmael is believed to have been born around 2150 BCE, with Isaac being born a hundred years later. Therefore, Islamic scholars have generally assumed that the Kaaba was constructed by Abraham around 2130 BC. The Kaaba is, therefore, believed by Muslims to be more than a millennium older than Solomon's Temple in Jerusalem, which is believed to have been finished in 1007 BCE. These dates remain consistent with the Muslim belief that the Kaaba is the first and thus oldest mosque in history. Upon Muhammad's victorious return to Mecca in 630, he and his son-in-law, Ali Ibn Abi Talib, broke the idols in and around the Kaaba and ended its pagan use. 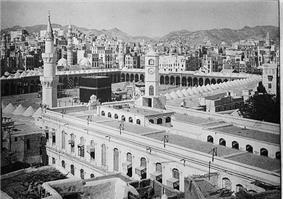 This began the Islamic rule over the Kaaba and the building of the Masjid al-Haram around it. The first major renovation to the mosque took place in 692. Before this renovation, which included the mosque's outer walls being raised and decoration added to the ceiling, the mosque was a small open area with the Kaaba at the center. By the end of the 8th century, the mosque's old wooden columns had been replaced with marble columns and the wings of the prayer hall had been extended on both sides along with the addition of a minaret. The spread of Islam in the Middle East and the influx of pilgrims required an almost complete rebuilding of the site which included adding more marble and three more minarets. In 1570, Sultan Selim II commissioned the chief architect Mimar Sinan to renovate the mosque. This renovation resulted in the replacement of the flat roof with domes decorated with calligraphy internally, and the placement of new support columns which are acknowledged as the earliest architectural features of the present mosque. These features are the oldest surviving parts of the building. During the heavy rains and flash floods of 1621 and 1629, the walls of the Kaaba and the mosque suffered extensive damage. 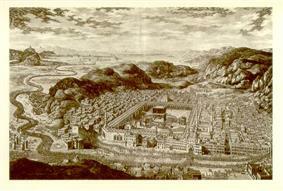 In 1629, during the reign of Sultan Murad IV, the Kaaba was rebuilt with stones from Mecca and the mosque was renovated. In the renovation of the mosque, a new stone arcade was added, three more minarets (bringing the total to 7) were built, and the marble flooring was retiled. This was the unaltered state of the mosque for nearly three centuries. The first major renovation under the Saudi kings was done between 1955 and 1973. In this renovation, four more minarets were added, the ceiling was refurnished, and the floor was replaced with artificial stone and marble. The Mas'a gallery (Al-Safa and Al-Marwah) is included in the Masjid via roofing and enclosements. During this renovation many of the historical features built by the Ottomans, particularly the support columns, were demolished. The second Saudi renovations under King Fahd, added a new wing and an outdoor prayer area to the mosque. The new wing, which is also for prayers, is accessed through the King Fahd Gate. This extension was performed between 1982 and 1988. The third Saudi extension (1988–2005) saw the building of more minarets, the erecting of a King's residence overlooking the mosque and more prayer area in and around the mosque itself. These developments have taken place simultaneously with those in Arafat, Mina and Muzdalifah. This third extension has also resulted in 18 more gates, three domes corresponding in position to each gate and the installation of nearly 500 marble columns. Other modern developments include the addition of heated floors, air conditioning, escalators and a drainage system. In 2007, the mosque underwent a fourth extension project which is estimated to last until 2020. King Abdullah Ibn Abdulaziz planned to increase the mosque's capacity to 2 million; although the King died in 2015, his successor is likely to continue renovations. Northern expansion of the mosque began in August 2011 and was expected to be completed in one and a half years. The area of the mosque will be expanded from the current 356,000 m2 (3,830,000 sq ft) to 400,000 m2 (4,300,000 sq ft). A new gate named after King Abdullah will be built together with two new minarets, bringing their total to eleven. The cost of the project is $10.6 billion and after completion the mosque will house over 2.5 million worshipers. The Mataaf (the circumambulation areas around the Kaaba) will also see expansion and all closed spaces will be air conditioned. On 11 September 2015, at least 111 people died and 394 were injured when a crane collapsed onto the mosque. The importance of the mosque is twofold. It serves as the common direction towards which Muslims pray, and is the primary destination for pilgrimages. The Qibla—the direction that Muslims turn to in their prayers (salat)—is toward the Kaaba and symbolizes unity in worshiping one Allah (God). At one point the direction of the Qibla was toward Bayt Al-Maqdis (Jerusalem) (and is therefore called the First of the Two Qiblas); however, this only lasted for seventeen months, after which the Qibla became oriented towards the Kaaba in Mecca. According to accounts from Muhammad's companions, the change happened very suddenly during the noon prayer at Medina in the Masjid al-Qiblatain. The Haram is the focal point of the Hajj and Umrah pilgrimages that occur in the month of Dhu al-Hijjah in the Islamic calendar and at any time of the year, respectively. The Hajj pilgrimage is one of the Pillars of Islam, required of all able-bodied Muslims who can afford the trip. In recent times, over 5 million Muslims perform the Hajj every year. Some of the rituals performed by pilgrims are symbolic of historical incidents. For example, the episode of Hagar's search for water is emulated by Muslims as they run between the two hills of Al-Safa and Al-Marwah. The Hajj is associated with the life of the Islamic prophet Muhammad from the 7th century, but the ritual of pilgrimage to Mecca is considered by Muslims to stretch back thousands of years to the time of Ibrahim (Abraham). The Kaaba (Arabic: الكعبة‎) is a cuboid-shaped building in the center of the Masjid al-Haram and is one of the most sacred sites in Islam. All Muslims around the world face the Kaaba during prayers, no matter where they are. 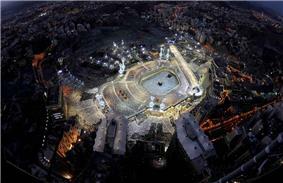 The direction from the location of the person who prays to the Kaaba is called the Qibla. The Hajj requires pilgrims to walk seven times around the Kaaba in a counter-clockwise direction. This circumambulation, the Tawaaf, is also performed by pilgrims during the Umrah (lesser pilgrimage). The Black Stone (Arabic: الحجر الأسود‎ al-Ḥajar al-Aswad) is the eastern cornerstone of the Kaaba. It was set intact into the Kaaba's wall by Muhammad in the year 605, five years before his first revelation. Since then it has been broken into a number of fragments and is now cemented into a silver frame in the side of the Kaaba. Its physical appearance is that of a fragmented dark rock, polished smooth by the hands of millions of pilgrims. Many of the pilgrims, if possible, stop and kiss the Black Stone, emulating the kiss that Islamic tradition records it having received from Muhammad. 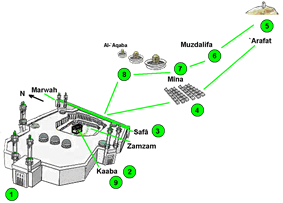 If they cannot reach it, they point to it on each of their seven circuits around the Kaaba. The Maqām Ibrahim (Abraham's place of standing) is a rock that reportedly has an imprint of Abraham's foot, which is kept in a crystal dome next to the Kaaba. This rock was identified by most Islamic scholars as the one behind which Muhammad prayed when he circumambulated the Kaaba. Several traditions existed to explain how Abraham's footprint miraculously appeared in the stone, including one suggesting it appeared when Abraham stood on the stone while building the Kaaba; when the walls became too high, Abraham stood on the maqām, which miraculously rose up to let him continue building and also miraculously went down in order to allow Ishmael to hand him stones. Other traditions held that the footprint appeared when the wife of Ishmael washed Abraham's head, or alternatively when Abraham stood atop it in order to summon the people to perform the pilgrimage to Mecca. 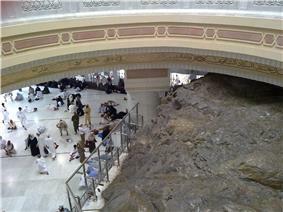 Al-Safa and Al-Marwah (Arabic: الصفا‎ Aṣ-Ṣafā, المروة Al-Marwah) are two hills, now located in the Masjid al-Haram. In Islamic tradition, Abraham's wife Hagar ran between the hills of Al-Safa and Al-Marwah looking for water for her infant son Ishmael until God eventually revealed her the Zamzam. Muslims also travel back and forth seven times during the ritual pilgrimages of Hajj and Umrah as a remembrance to her sacrifice. A halaqa underway at the western part of the main complex. The Zamzam Well (Arabic: زمزم‎) is a well located 20 m (66 ft) east of the Kaaba. According to Islamic belief, it began circa 2150 BCE when Abraham's infant son Ishmael was thirsty and kept crying for water. 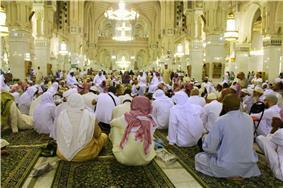 There are mainly two groups of people in terms of spiritual leadership in the mosque. These are imams and muadhins. Imam is a clerk who leads prayer in the mosque. There are several imams and a lead imam of the Masjid al-Haram. Abdul Rahman Al-Sudais is the current chief imam of the Masjid al-Haram. Muadhin performs Adhan (call to prayer) and Iqamah duties in the Masjid al-Haram. Several families share these duties including Mulla, Shaker, Rayes, Al-Abbas, Hadrawi, Basnawi, Khouj, Marouf and Faydah. Some of these families held this position for hundreds of years; for example, the al-Abbas. There are Approx 17 Muadhins at the mosque, and during Ramadan an additional six are appointed. Apart from Adhan, a Muadhin also supports Imams by repeating the Arkaan, they say in a loud voice. Sheikh Abdullah Al-Khulaifi (عبد الله الخليفي), Khalifah of Imam Muhammad Zakariyya al-Kandhalwi. Scholar of Tassawuf. Sheikh Ahmad Khatib Al-Minangkabawi, Scholar of Indonesia. Sheikh Ali Jaber (على بن عبد الله جابر), Maliki Jurist of Mecca. Sheikh Shaheede-Islam Umar Al-Subayyil (عمر السبيل), Active Member of Khatame-Nabbuwwat Organisation. Sheikh Minister of Haramain Muhammed Al-Subayyil (محمد السبيل), Khalifah of Imam Muhammad Zakariyya al-Kandhalwi. (Died in 2013). Sheikh Abdullah Al Humaid (عبد الله الحميد), Former Chief Justice of Saudi Arabia. Sheikh Abdullah Al-Harazi (عبدالله الحرازي), Former Chairman of Saudi Majlis al-Shura. Sheikh Abdullah Khayyat (عبدالله خياط), Former Chairman of Council of Senior Scholars (Saudi Arabia). Sheikh Ali Bin Abdur Rahman Al Hudhaify, now Chief Imam of al-Masjid an-Nabawi. Member of Saudi Arabians Al-Hilaal Committee. Sheikh Justice Doctor. Salah Ibn Muhammad Al Budair, now Deputy Chief Imam of al-Masjid an-Nabawi. Sheikh Minister Dr. Abdul Rahman Al-Sudais (عبد الرحمن السديس), Chief of Imams at the Masjid al-Haram, & Current President of Haramain. Sheikh Justice Dr. Saud Al-Shuraim (سعود بن إبراهيم الشريم), Deputy Chief Imams at the Masjid al-Haram. Sheikh Dr. Abdullah Awad Al Juhany (عبدالله عواد الجهني), Lecturer of Quran and Sunnah Faculty at Umm al-Qura University. Appointed in July 2007. Sheikh Dr. Maher Al Mueaqly (ماهر المعيقلي), Professor at King Abdullah Saood Islamic University. Appointed in July 2007. Sheikh Dr. Khalid Al Ghamdi (خالد الغامدي), Judge of Da'awah and Usool Ad-Deen Faculty at Umm al-Qura University. Appointed after Hajj 2008. Sheikh Justice Dr. Salih bin Abdullah al Humaid (صالح بن حميد), President & Supreme Advisor in the Saudi Royal Diwan. Sheikh Dr. Usaama bin Abdullah al Khayyat (أسامة بن عبدالله خياط), Senior Dean and Professor of Higher Islamic Studies at Umm al-Qura University. Sheikh Dr. Saleh Al-Talib (صالح ال طالب), Appointed in 2003, Deputy Assistance Imam. Sheikh Dr. Faisal Jamil Ghazzawi, Assistant Professor and Chairman of Qiraat Department at Umm al-Qura University. Sheikh Dr. Bandar Baleelah. Assistant Professor at The Islamic University of Taif.- Appointed in 2013. Sheikh Dr. Yasir Dossary. Appointed in 2015, Assistance Taraweeh Imam. Bayt Al-Mawlid, the house where Muhammad was born, demolished and rebuilt as a library. Dar Al-Arqam, the first Islamic school where Muhammad taught, was flattened to lay marble tiles. The house of Abu Jahal has been demolished and replaced by public washrooms. Dome which served as a canopy over the Well of Zamzam demolished. Some Ottoman porticos at the Masjid al-Haram demolished and those remaining are under threat. House of Muhammed in Medina where he lived after the migration from Mecca. ^ a b c M.J. Kister, "Maḳām Ibrāhīm," p. 105, The Encyclopaedia of Islam (new ed. ), vol. VI (Mahk-Mid), eds. Bosworth et al., Brill: 1991, pp. 104-107.